2015 Topps Chrome WWE brings the metal and color that are the brand's signature as well as on-card autographs, relics and other inserts. The 100-card base set has a mix of current WWE Superstars, Divas, NXT prospects and retired legends. It wouldn't be Topps Chrome without the Refractors. 2015 Topps Chrome WWE has plenty of them. Basic Refractors land one per pack. Other levels include Pulsar (#/75), Gold (#/50), Silver Wave (#/20), Shimmer (#/10), Red (#/5) and Superfractor (1/1). Base cards also have Printing Plates. Single-signed autographs come with on-card signatures, something that's, unfortunately, rare in a lot of modern wrestling sets. Like the base set, there's a mix of stars from today and yesterday. Tomorrow is represented by NXT autographs. Each signer is slated to have about 175 basic autographs and 10 Gold Refractor parallels. Dual Autographs may use stickers but they're limited to just five copies. Diva Kiss Cards have a lip imprint from a current Diva. Basic versions have 100 copies each. There are also Autographed Kiss Cards that are limited to 25. 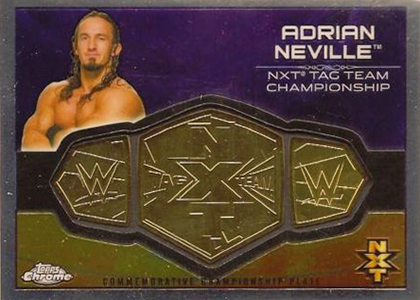 Event-used relics come in several forms in 2015 Topps Chrome WWE. Chrome Swatch Relics use shirts and gear worn by wrestlers. The product also has mat relics from 2014 Night of Champions, signs from the 1993 King of the Ring and the first turnbuckle relics (no word on if George "The Animal" Steele has one). Commemorative Championship Plates return, this time focusing on NXT champions. 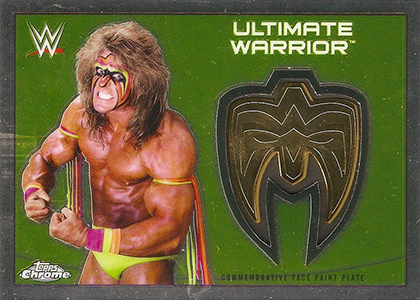 There's also a special Ultimate Warrior Face Paint Plate card. Hulk Hogan Tribute carries on from where it started in 2015 Topps WWE. While ten cards can be found here, the remainder of the set is spread across Topps' other 2015 WWE products. 2015 Topps Chrome WWE hobby boxes come with two total autographs, relics or commemorative plates. 2015 WWE Topps Chrome Adam Rose Autograph Rookie Card. 2015 TOPPS CHROME WWE WRESTLING GOLD REFRACTOR ALEXA BLISS 50 ROOKIE Bgs 9.5! 17 The Mega-Maniacs Take on Money Inc.
Will Finn Balor and Kevin Owens be debuting in this set? Is there Silver Wave Refractor #/20? I haven’t seen one yet pulled. Jay � It was on the sell sheet, but it looks like it may have been scrapped. I just started collecting this year and I love it. A case of 2015 Topps yielded a few big hits, and I just started opening my case of Chrome. This morning I pulled a John Cena, Bray Wyatt dual autograph 1/5! I will share a picture on Twitter later today. I’m so excited!